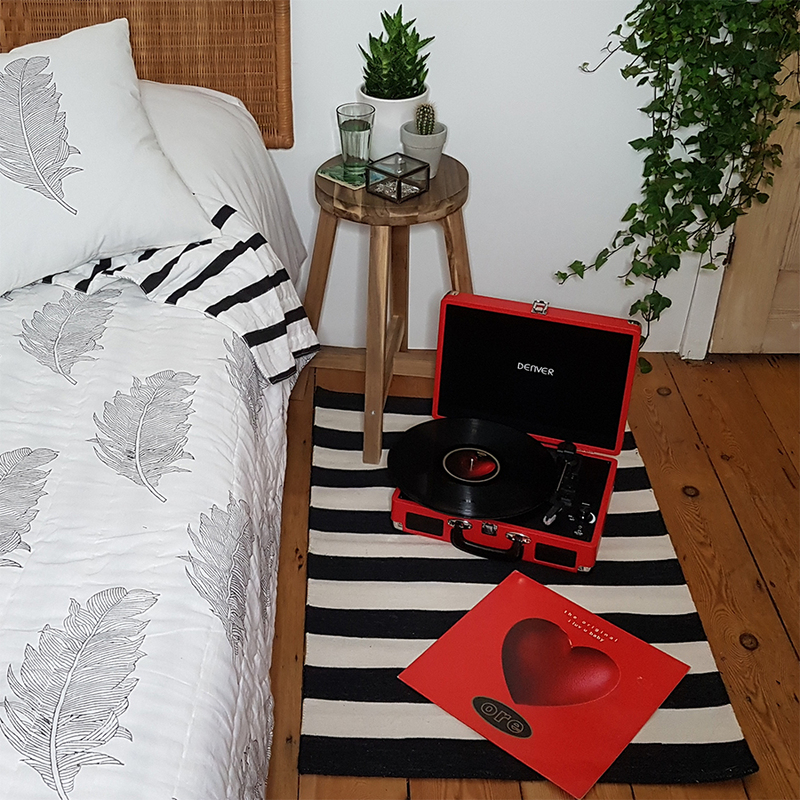 The Denver VPL-120 retro record player at £39.99 +P&P is a stylish, vintage look turntable in red for Valentines Day and also in the black/red, blue and brown colour options. Really easy to use, it comes in a vintage-style suitcase with built-in speakers so it’s easy to carry around from room to room. The triple speed option allows you to play those favourite 33.3 rpm albums, the classic 45rpm singles and the really vintage 78rpm records. Unlike the old days of vinyl record players, the record will stop playing once it’s finished, there’s a line-out socket for external hi-fi or amplifier connection and a headphone jack. You can even record and share your new vinyl finds through a USB connection, which records the music onto your PC and converts it to MP3 or WAV files. At only £17.99 +P&P, the BTS-63 is a new style of textile speaker bringing sleek Nordic design to the style conscious music lover. Available in pink, blue and black/grey to match any decor, with tactile fabric speakers, smooth rubber edging and soft PU leather carry strap, it feels as good as it looks and sounds. Play your music from your smartphone, MP3 player, iPhone or PC either wirelessly via Bluetooth 4.1 or through a USB or aux-in connection. You can even charge your phone at the same time! The 2 x 3W RMS speakers give you great sound and with a Bluetooth operating range of 8-10 metres, your tunes will continue to play even from the other side of the room. With 3 hours of playing time when the built-in battery is fully charged, you and your party guests can listen to your music in style. Do you have someone you’ll be missing this Valentines Day as they’re far away right now? A Denver PFF Digital Photo Frame offers a new type of social photo sharing, with images and messages you share automatically popping up on screen, just for your loved one’s eyes. It’s the perfect gift for anyone who loves photo updates from family and friends without having to trawl though all the other notifications on social media. The photo frame keeps your precious moments private; unlike social media apps, it’s FRAMEO app does not store or have any access to the photos, they’re saved only on the photo frame’s 8GB storage or your SD card. Available in slightly different styles and sizes, from £64.99 +P&P to £99.99 +P&P, in black or white, it’s a perfect way to update and stay in touch this Valentines Day and beyond. It’s easy for anyone to set up and use, just pair the frame with WiFi, download the free FRAMEO app on your phone, push the photo with a message caption to the photo frame which beeps to let you know the photos is on screen to view. We hope you have a lovely Valentines Day, with a toast to a partner or to yourself – you deserve it!